Etna Bed & Breakfast i Catania, Italien: Reservér nu! The Etna Bed & Breakfast, located in Belpasso, a typical Sicilian town that lies between Mount Etna and the city of Catania. Our position is convenient and central thus offering an ideal opportunity to visit a vast range of attractions within the radius of 15km such as Mount Etna, Beaches, Medieval Norman Castles, Fortresses, Monuments and Ruins. 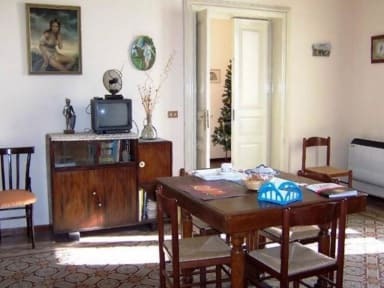 Rest assured you will experience a pleasant taste of typical Sicilian lifestyle in our antique B&B. We are situated in the same territory as Etna land attraction park and the gigantic Etnapolis Hyper market. At the Etna Bed & Breakfast you can expect warm hospitality and convenient prices. Please do not hesitate to contact us or ask any questions about your vacation. We are more than happy to assist you in making your stay here in Sicily as fulfilling as possible! Enjoy a unique experience in an eighteenth century Sicilian noble construction where the antique floors, voltaic ceilings and terraces can be admired. Our guests may also make use of our lounges, outdoor terraces, dining suite and kitchen. We hope our guests may find all the necessary comfort that one may desire away from home in a relaxed and comfortable environment. All Rooms are very spacious, air-conditioned and provide a private bathroom or En-suite depending on availability and requests. Breakfast is naturally included at no additional cost. Surrounded by nature in all its beauty, Mount Etna attracts thousands of tourists from all over the world every year. The 3323 meter high active volcano can be visited from our location via Rifugio Sapienza at 15km (Etna south). Here you may proceed on foot or opt to pay for a guided trip on a 4-wheel-drive vehicle or take the cable car to reach the summit. There is plenty to see like the solidified rivers of lava and great views plus souvenir shops, old fashioned houses and restaurants.